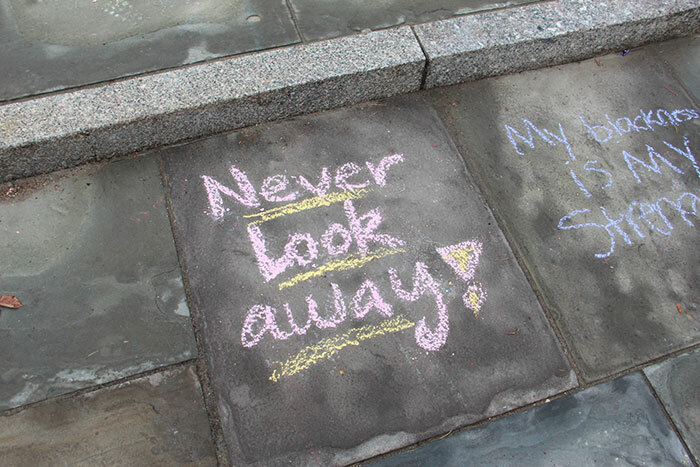 On Thursday afternoon, November 5th students gathered in front of Sterling Memorial Library around noon to chalk inspiring and supportive messages on Cross Campus plaza in light of the recent events that have hurt and devastated students of color and in particular, women of color. 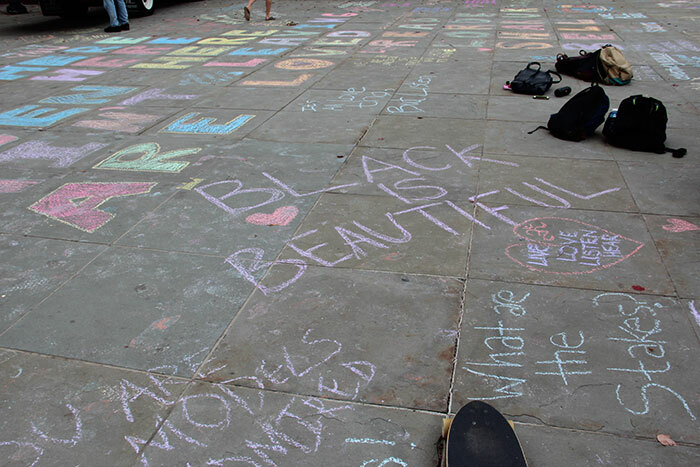 The event was organized by the Black Student Alliance at Yale (BSAY) and was initially a simple, but powerful way to have their voices heard. However, it soon became a public forum for students of color to personally voice their grievances to a university administrator when Dean Jonathan Holloway made an unexpected appearance. 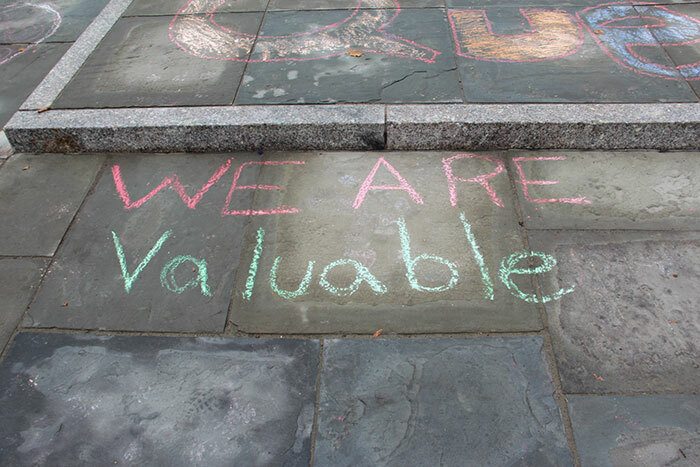 Here are just a few of the profound messages students left on Cross Campus plaza. 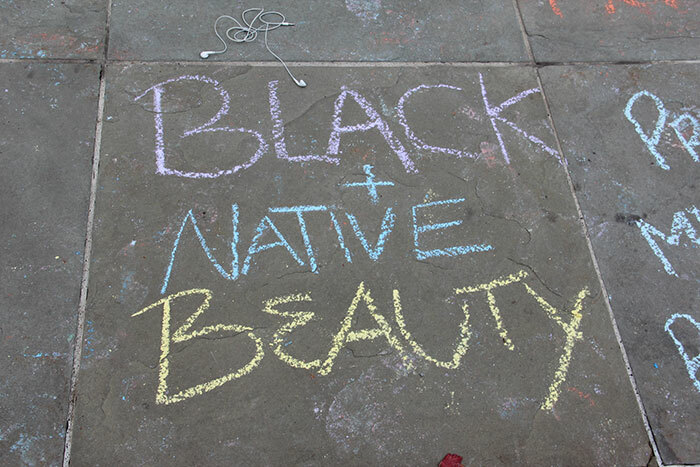 Despite the showers that followed, the declarations and important questions they etched in chalk about what it means to be a student of color at Yale left an indelible mark on the campus conscious. Students’ response to Associate Master Christakis’ suggestion to “look away” from culturally insensitive and appropriative costumes on Halloween. Halloween weekend, a time that should have been fun and carefree for most students on campus, soon became one of pain and shock when Christakis’ blatantly insensitive email spread beyond Silliman College and proliferated the student body. Many were outraged by Christakis’ suggestion to simply “look away” from costumes that might mock their cultural heritage or reduce their faith or cultural practices into jokes and stereotypes. Her careless words implied that other people’s right to don racist costumes was more worthy of protecting than students’ of color’s right to live in a tolerant and safe environment. Her email completely devalued the experiences of minority students and instead sought to defend a majority that didn’t need defending in the first place. Christakis tried to say that the IAC’s email implied a lack of trust that administrators have in students. Ironically enough though, Christakis’ claim that students must be prepared for the harsh realities of ignorance and prejudice beyond Yale implies a complete lack of faith in students’ competence and awareness. Of course students of color aren’t so naïve as to think the world functions in the same way their liberal education system does. However, they still have every right to expect that system to do everything in its power to provide a tolerant and socially conscious space for them. 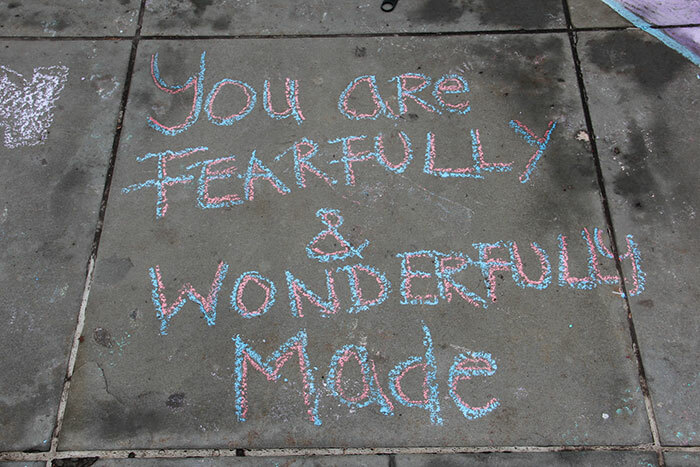 Students wrote many beautiful affirmations of worth and value in light of how many female students of color have felt undervalued, ignored, and dehumanized in their time at Yale. On Halloween evening black and hispanic female students reported being turned away from a party being hosted by Sigma Alpha Epsilon (SAE) with a fraternity member stating that they were on a “white girls only” basis for entrance. The fraternity had already received strict sanctions last year following an incident in which an initiation ceremony violated Yale’s policy on sexual misconduct. The sanctions had included banning on-campus activities, communication through Yale University email systems and bulletin boards, and use of Yale’s name in connection with SAE, all in effect until August 2016. Despite SAE’s denial of these accusations, another student of color recalled being treated with the same disrespect a year earlier. 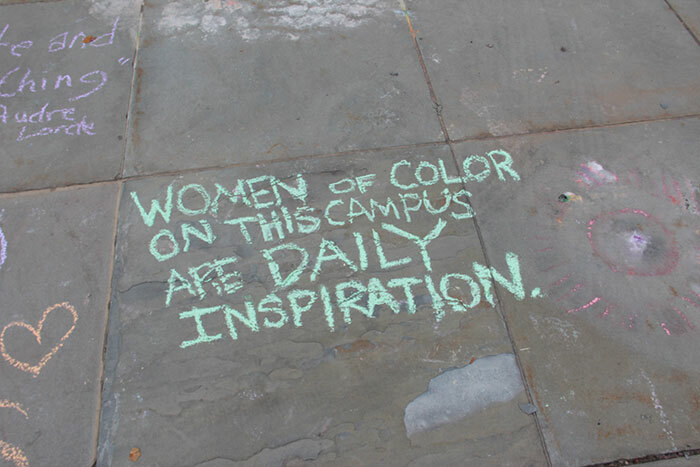 Soon, more female students of color took to social media to recount similar incidences of being blatantly victimized and discriminated due to their race and gender at different points in their Yale careers. 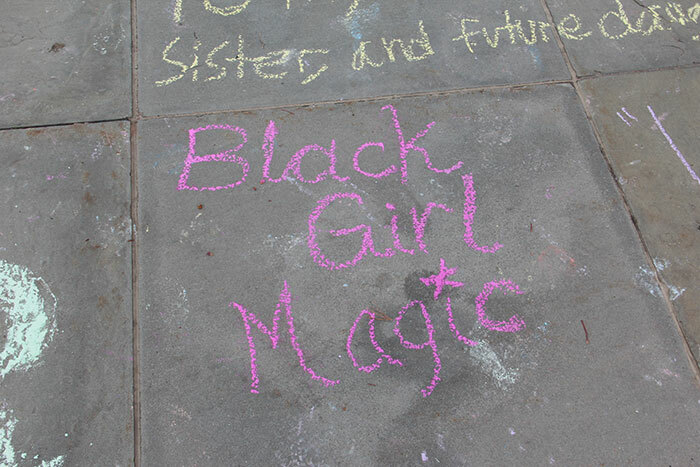 The incident itself brought to light the state of marginalization many women of color experience in their time on campus. In light of the dialogue the two events ignited on campus, a moderated discussion was held at the Afro-American Cultural House on Wednesday night aptly named “[Ad]dressing Appropriation and the Power of Language”. All Yale community members were encouraged to come whether to partake in the conversation, listen, or just be present. Attendance was greater than any expected, with so many students wishing to attend that a second room was prepared to accommodate the overflow. Associate Master Christakis was also present for some time, listening to students’ frustrations with her problematic letter and the trivialization of cultural appropriation that her suggestions to merely “look away” imposed. However, Christakis left the discussion shortly to teach a class. The stakes are high for students of color. The events that precipitated were not just isolated incidents– they were the culmination of a lack of respect and security many students of color have been afforded on this campus. A student voiced their frustration in school administrators’ delay in responding to the pain and anguish that many students had been feeling that week, the silence connoting a lack of priority of students of color. 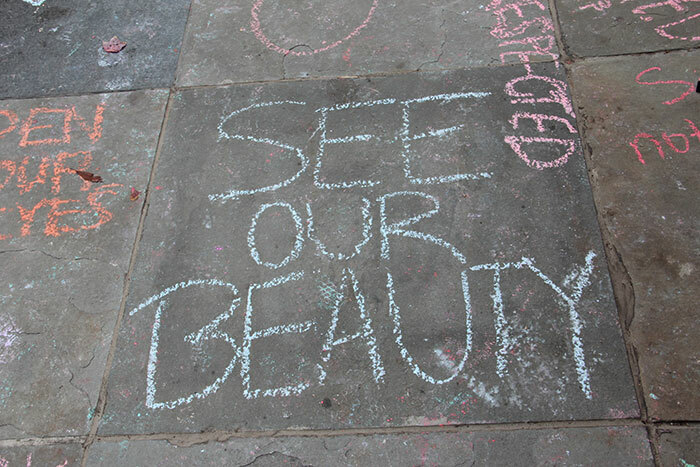 On Thursday afternoon streaks of colors decorated the pavement as students from all backgrounds took time out of their day to reaffirm their beauty and value or stand as strong allies to their peers affected by the disheartening events that took place over the weekend. 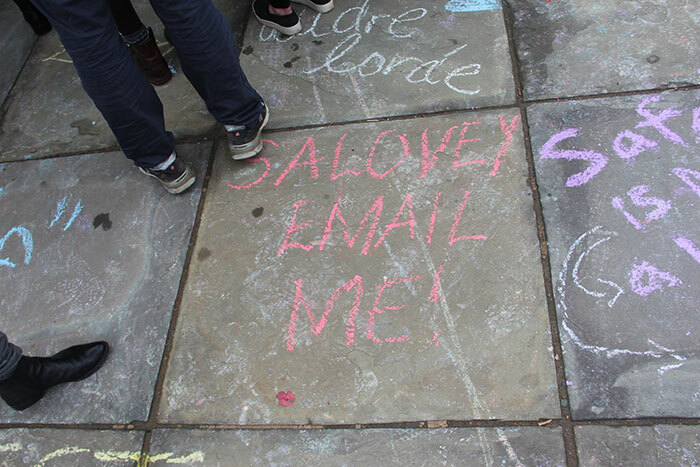 Mere minutes before Dean Holloway’s arrival, students had collectively chanted, “Where’s our email?”, calling into the question the central administration’s delay in directly responding to the frustration, hurt, and betrayal many of the student body’s young people of color had been facing throughout that week. The silence on the inflammatory email sent by a Yale faculty member and the claims of racist conduct by a fraternity (that had already clearly violated Yale’s policies on creating a safe climate around campus) stunned and frustrated students. It was a question that weighed down upon many– where was the support? 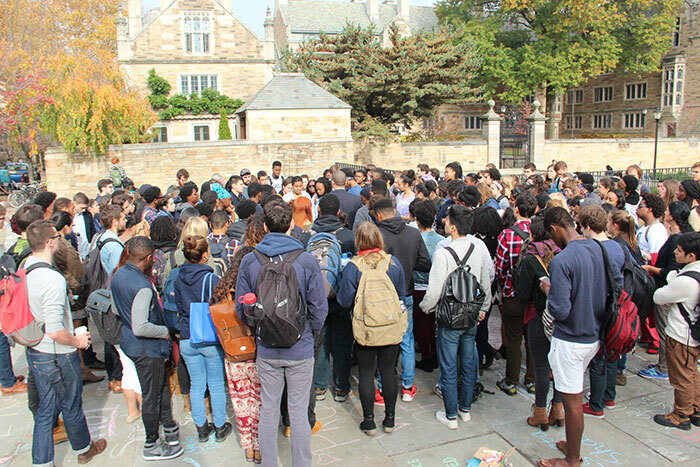 A crowd of students surrounds Dean Jonathan Holloway as BSAY and YBWC leaders explain their frustrations and disappointment with the lack of comfort, security, and embrace that they have felt through their Yale careers. When Dean Holloway appeared at the event, BSAY and Yale’s Black Women’s Coalition (YBWC) leaders were quick to confront him and address their key grievances, which included the higher administration’s deafening silence. Holloway stayed in the throng for almost two hours, listening to students’ of color’s questions about his silence during the last few days, the profound, everyday struggles they go through as minorities on campus, as well as the ways the deficit of tolerance and support could be amended, including better mental health programs for students of color and proper diversity and tolerance training for all faculty members and students. Later in the day President Peter Salovey followed with another message addressing the discussion of cultural appropriation and the status of students of color on campus. He further emphasized the importance of making Yale a place that is home for all students. Nonetheless, he still sought to note the importance of free speech on campus. Now the question that is everyone’s mind: where do we go from here? Even though the preceding days have been emotionally exhausting and physically draining for many, students are seizing upon this opportunity to bring about change on campus to foster a warmer and more open environment for all. Salovey mentioned future plans to begin working towards this goal and has stated that he’ll bring more news in the coming weeks before Thanksgiving. Right now, conversations are still going on and students of all backgrounds are trying to grapple with the issues that have come to forefront. One major discussion that has come out of this is the importance of solidarity. This change can only come about if the people who have been silenced, ignored, and devalued are finally heard, and the voices like that keep trying to drown them out are no longer supported. So if you’ve personally been affected by the events, please share your thoughts, experiences, and accounts. They are valid and of great value. And if you weren’t impacted by these events, then just listen to those who have been. Don’t interrupt, jump in, or listen for the sake of preparing your contribution. Just listen. 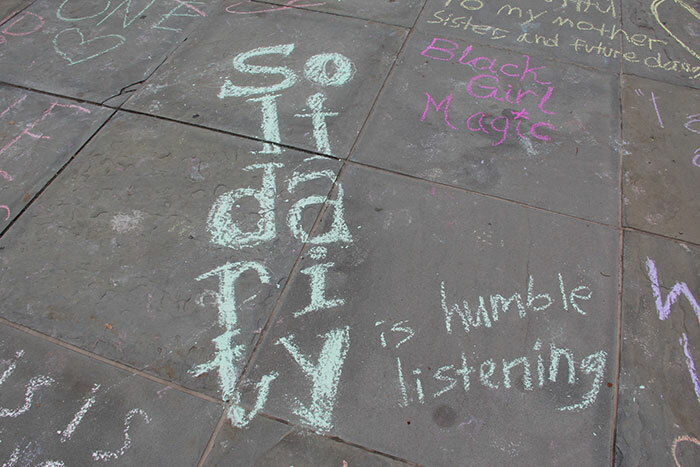 That is solidarity.